Ever since boys' comics were first published in the middle years of the nineteenth century, they have offered readers fun, adventure and escapism. This book tells the stories of footballing heroes. It presents the history of the comic book footballer. It introduces the magic of these imaginary sporting stars to a whole new generation. Ever since boys' comics were first published in the middle years of the nineteenth century, they have offered readers fun, adventure and escapism. As participation and attendance at sports events rose dramatically in the early years of the twentieth century, so boys' comics focused more and more on sportsmen, with footballers becoming the ultimate favourites. Millions of boys' comics were sold in the 'golden age' in the 1920s and '30s. The introduction of football stories in cartoon-strip format proved immensely popular, and during the 1950s and '60s comics enjoyed a renaissance, with "The Rover", "Tiger and The Hotspur" among the top titles. The 1970s saw the launch of dedicated football comics such as "Scorcher" and "Score 'n' Roar". Within the pages of these titles, legends were born, but for every "Hot Shot" Hamish there were dozens of other footballing heroes, and this book tells their stories, too. Although these comics are no longer in circulation, they still generate a huge level of interest among boys and men of all ages, and the culture of the comic book hero continues. Using the archives of publishers DC Thomson and Co. Limited, IPC Media Limited and Egmont UK Limited, the authors have produced a definitive history of the comic book footballer. 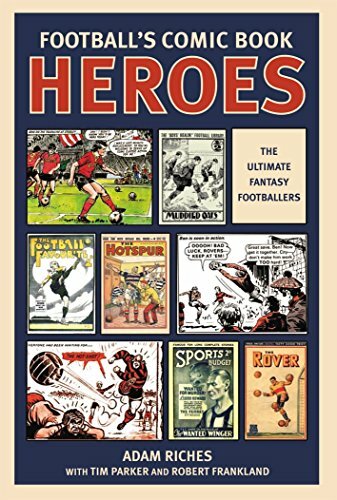 This unique and nostalgic account of the football comic book phenomenon will jog the memories of older readers and introduce the magic of these imaginary sporting stars to a whole new generation.